24/7/365 I'm Alive is an indie cross-over album, spanning alternative rock to alternative country, produced with soft hands and a big voice! I am a seasoned singer-songwriter from Vancouver, Canada. My music, an indie cross-over between alt rock and alt country, has been described as being "rich in lyrical imagery!" by the Vancouver Sun. Recording Magazine heard a "Jim Morrison vibe! ", while the Vancouver Courier praised my "perfect pop hooks!" Many more compliments have been published by various media outlets and are noted on my webpage at drewbarnes.com. 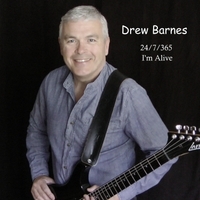 With this release of my new album "24/7/365 I'm Alive", I take a step in a new direction musically and, I feel that I have finally achieved the sound I have been looking for! I will continue playing live at pubs, clubs and coffeehouses, basically anywhere I can find an audience! My influences come from the streets of downtown Vancouver, particularly the high-octane Granville Street Entertainment District where, I have carved out a living as a hospitality professional for many years. The street gives me countless song ideas as I'm sure is evident in my music! I am also greatly influenced by a youth spent in the wilds of central British Columbia, where the impact of raw nature forged an ever-lasting impression. Thank you for your support of indie music because as it's been said, if there's no audience, there's no show!